There are multiple ways to delete your survey. The most common one is from the survey list. For more details, click on the following link. 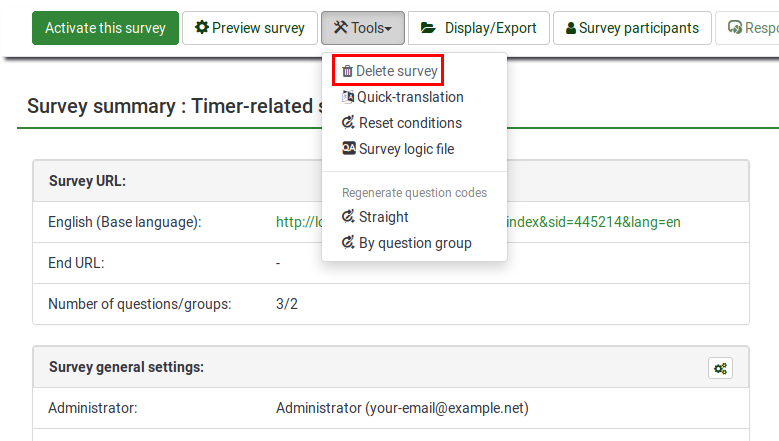 We highly recommend our users to export the survey and its corresponding responses table before deleting it. The responses table is getting archived and it can still be recovered for a limited period of time. However, for the sake of simplicity and to avoid further import-related complications, we recommend our users to also backup the responses table. This page was last edited on 10 December 2018, at 12:49.